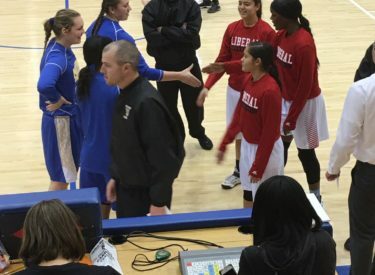 Liberal’s 1-3-1 trap flustered Wichita Collegiate early and often as the Liberal Lady Redskins won handily 62-36 Saturday in Cheney. The Lady Redskins jumped to leads of 12-0, 14-2, 24-6, and 38-12 (halftime) on their way to the blowout win. Jada Mickens scored 17 to lead the Lady Red. Reyna Gonzalez and Whitney Hay added eight a piece in the win. Ten Lady Skins scored in the game against class 4A division 2 Collegiate. Liberal is 4-0 for the first time since the 2008-09 season when they began the season 9-0. The Lady Spartans are 1-3. Liberal hosts Perryton Friday at 6 with Redskin Pre-game at 5:45 on 1270 and kscbnews.net.